The issue of who has the ability to choose the district's legal counsel has recently pitted at least one school board member against the new superintendent. FAIRFIELD — Officials in the local school district are expected to look Monday at the controversial issue of selecting legal counsel for the district, an issue that has recently pitted at least one school board member against the new superintendent. At the heart of the issue is a debate over whether the School Administrative District 49 board or the superintendent has the right to choose the district’s legal counsel, and if it’s the latter, what steps need to be taken to make the full board aware of the choice. 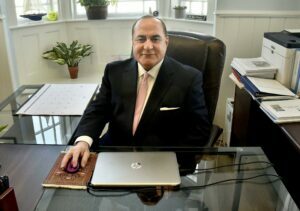 The debate also arises as the district faces potential legal action stemming from a controversial administrative restructuring plan introduced by Superintendent Reza Namin, who took over in August when long-time superintendent Dean Baker retired. The meeting is scheduled for 6:30 p.m. Monday at the Lawrence Junior High School multi-purpose room. Namin said Friday the school board has the ability to contract a legal firm but had never voted on one firm, and he said the superintendent also has the authority to seek legal counsel. For years, the district has relied on the Portland law firm Drummond Woodsum for legal matters, but this year Namin also sought council from the firm Jensen Baird Gardner & Henry, also of Portland. Namin said his decision was based on cost and that the hourly rate for Drummond Woodsum is $350 or more, while the new firm has an hourly rate of $155 to $250. At the last school board meeting in March, he said he “did not switch” firms but had told the board chair and vice chair at one point he intended to seek additional counsel in part to look at specific questions. However, one school board member, Kara Kugelmeyer, of Albion, said it’s not up to the superintendent or just a few board members to make such a decision, and the full board should have voted to use the new firm. At the meeting, Namin asked Kugelmeyer if she was questioning his authority to seek legal counsel. Steve Bailey, executive director of the Maine School Management Association and Maine School Boards Association, said typically superintendents carry out the school board’s business and any attorney hired for a district is usually hired by a board. He said there’s nothing in state law that spells out the terms of how a superintendent conducts the business of a board, and usually such decisions are made locally. Bailey also said it would be unusual for a district to use more than one legal firm. Most have one firm, and that firm might supply the district with different attorneys based on the aspect of law they are concerned with. The terms of the agreements often vary by district, with larger school districts more apt to have a firm on retainer while a smaller district might use a firm only on an as-needed basis. Shelley Rudnicki, the school board chair, did not respond to requests for comment Friday. However, at the March meeting, she said she didn’t see anything wrong with the superintendent selecting the legal counsel. In his email Friday, Namin said the issue of who the district was using as counsel was never an issue earlier in the year. However, at the February meeting, it was announced that board members had received an email threatening the district with a lawsuit because of the restructuring changes, which include eliminating some jobs and restructuring or changing the job descriptions of others. The district has declined to release the letter to the Morning Sentinel saying to do so would be a violation of Maine law protecting the privacy of certain employment records. At the time, Kugelmeyer said she thought the district should share the letter with both law firms because the board was already comfortable with Drummond Woodsum, but the superintendent had also forged a relationship with Jensen Baird Gardner & Henry. Kugelmeyer declined to comment further on the issues surrounding legal counsel Friday. “So are you questioning the legal counsel’s accountability?” Namin said to her at the February meeting. “Historically, we used to have like a uniform vendor that dominates the cost, so I decided to have one I felt is credible, one I felt has the background. At the last meeting, the board talked about putting out to bid a contract for legal counsel, though no action was taken to vote on that. Namin said Friday the district is investigating either moving ahead with the bid or discussing the use of Jensen Baird Gardner & Henry as the district counsel, the latter of which is on the agenda for Monday’s meeting. At the last meeting, board Vice Chair Tim Martin said the transition to a new superintendent has not been easy.